Who am I? Who are you? What is it that defines who we are? In large part, what we do with the (give or take) 2.239 billion seconds or 71 years in the average lifespan says the most about who we are and who we ultimately become. Generally, what we say with our voice and what we do with our hands over and over and over again are the most prominent outward indicators of what makes us, us. Our actions rarely betray who we are deep inside. We could make this more complicated but overall, I think this is generally true. If your worldview accepts a morality that consists of good and evil, where God represents all good and the devil represents all evil, their influence pulling us in either direction, then you may find the rest of this post to be of interest. Boiling it all down to the very basics, then, the key players in the life story are God, the devil, and man (i.e. women and men). If hands represent our everyday choice-making between good and evil, could we not use “hands” to also represent the roles of God and the devil in the struggle for the soul? The relatively brief Book of Moses is one of the LDS canonized books (like the Book of Mormon) revealed to Joseph Smith. It contains extra-Biblical accounts of Moses and his vision of ancient patriarchs Adam, Enoch and Noah. For any skeptics, Yale University professor Harold Bloom found it surprising that the book contains a great deal of ancient Jewish material unavailable to Jews and Christians of Smith’s time. He is also a fan of Smith, calling him an “authentic religious genius.” But my purpose here isn’t to defend the book’s validity, neither was it Bloom’s (although unlike Bloom, I do believe the book is of divine origin). Instead, my aim is to share this broadly, with the view that anyone could gain valuable insight from these words. The word “hands” is found at the very beginning of the book in the fourth verse. In a grand vision, God promises to show Moses only part of the workmanship of his hands. Moses 1:4 And, behold, thou art my son; wherefore look, and I will show thee the workmanship of mine hands; but not all, for my works are without end, and also my words, for they never cease. God’s hands and words are incomprehensibly endless, but he is willing to show a comprehensible amount to Moses, revealing who he is. A few chapters later after a creation story similar to that found in Genesis, when only focusing on the “hand” verses, we learn that God acted to protect the freedom of Adam and Eve. This Book of Mormon reference offers an explanation of why God’s intervention was necessary. Moses 5:29 And Satan said unto Cain: Swear unto me by thy throat, and if thou tell it thou shalt die; and swear thy brethren by their heads, and by the living God, that they tell it not; for if they tell it, they shall surely die; and this that thy father may not know it; and this day I will deliver thy brother Abel into thine hands. In this first reference of Satan and hands, Satan promises to empower Cain’s hands. Moses 5:33 And Cain gloried in that which he had done, saying: I am free; surely the flocks of my brother falleth into my hands. The principle reason behind the murder was to gain possession of his brother’s flocks and find freedom. Moses 5:36 And now thou shalt be cursed from the earth which hath opened her mouth to receive thy brother’s blood from thy hand. Moses 6:15 And the children of men were numerous upon all the face of the land. And in those days Satan had great dominion among men, and raged in their hearts; and from thenceforth came wars and bloodshed; and a man’s hand was against his own brother, in administering death, because of secret works, seeking for power. Moses 6:32 And the Lord said unto Enoch: Go forth and do as I have commanded thee, and no man shall pierce thee. Open thy mouth, and it shall be filled, and I will give thee utterance, for all flesh is in my hands, and I will do as seemeth me good. We read in the previous verse that the Lord has power over all flesh, including the ability to keep Enoch from being hurt or harmed. This promise is fulfilled in the next verse when “no man laid hands on him.” This new information leads me to wonder whether earlier, Satan was able to “deliver” Abel into Cain’s hands, or if he simply told Cain what he was capable of doing with or without Satan’s help. Moses 6:39 And it came to pass when they heard him, no man laid hands on him; for fear came on all them that heard him; for he walked with God. Moses 7:26 And he beheld Satan; and he had a great chain in his hand, and it veiled the whole face of the earth with darkness; and he looked up and laughed, and his angels rejoiced. I would be interested to know why a chain is used and how a chain could veil the earth with darkness. A chain is referenced in 7:57 below, which is probably the connection? Moses 7:36 Wherefore, I can stretch forth mine hands and hold all the creations which I have made; and mine eye can pierce them also, and among all the workmanship of mine hands there has not been so great wickedness as among thy brethren. The previous verses also provide an answer to the age-old question why, if the Lord’s hand has power over all flesh, he allows wars, murders, destruction, and suffering? If he is able to keep the hands of men from harming Enoch, his prophet, why doesn’t he stop all destruction and suffering? The answer is plainly given in 7:32 above, where we see that he gave man agency. I believe the reason the Lord intervened to prevent Enoch from getting hurt is that he had given Enoch a commandment. So in this case, the Lord would not allow anyone to stop him from fulfilling that command. Some might scoff and say that is unfair, but was the command a dictatorial directive to harm others? No! It was to help the people return to God so there could be peace. If anyone was inconvenienced, it was Enoch. But because of his great faith, my guess is he was willing to comply. What’s more, we learn in the next few verses that it pains the Lord greatly to see those who have chosen rage and murder. We learn here that both the Lord and all the workmanship of the Lord’s hands weep for those who follow Satan. Moses 7:40 Wherefore, for this shall the heavens weep, yea, and all the workmanship of mine hands. Continuing on, we move to the Noah account where, similar to the promise given to Enoch, the Lord preserves the ark, because it was held in the Lord’s own hand. Moses 7:43 Wherefore Enoch saw that Noah built an ark; and that the Lord smiled upon it, and held it in his own hand; but upon the residue of the wicked the floods came and swallowed them up. Again, this might be seen as an interference of the Lord on the agency of man, but we read that Noah was commanded to build the ark to save those who followed him, so in this case, and because of the great faith of Noah, the Lord preserves the ark with his own hand. Finally, the account turns to the time of Jesus, when he is lifted on the cross and then resurrected. Being saved, according to this verse, is akin to being crowned, when found in favor at the right hand of Jesus, and then in the next verse, the right hand of God. Moses 7:57 And as many of the spirits as were in prison came forth, and stood on the right hand of God; and the remainder were reserved in chains of darkness until the judgment of the great day. And the spirits, or those who had died before Christ’s resurrection, were freed from prison and enabled to stand at God’s right hand, also in a saving manner. Moses 8:9 And he called his name Noah, saying: This son shall comfort us concerning our work and toil of our hands, because of the ground which the Lord hath cursed. It is almost as if the Lord is reminding us that after only using the word “hands” to describe the stark difference between His hands and the devil’s, as well as comparing His vast creation with man’s vast destruction, that the hand of man is not only prone to evil. Lamech’s hands, we are told, “worked and toiled” for many years in order to gain some value from the cursed land. Lamech didn’t promise that his son, Noah, would heal the ground. Rather, Noah would comfort his parents and family in their work. Perhaps the lesson here is that as we go through life, we must keep our hands busy, following the example of our creator by “toiling and working,” remembering that we are the workmanship of hands greater than ours, and not fearing the hands of them who are following one whose only accomplishment is spreading darkness, rage, and murder. 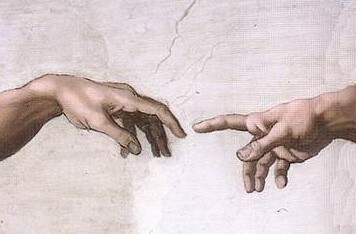 When we consider the greatness of the Lord’s creation made by His own hands, reflect on the significance of the Savior’s hands as pierced and scarred for our sake. 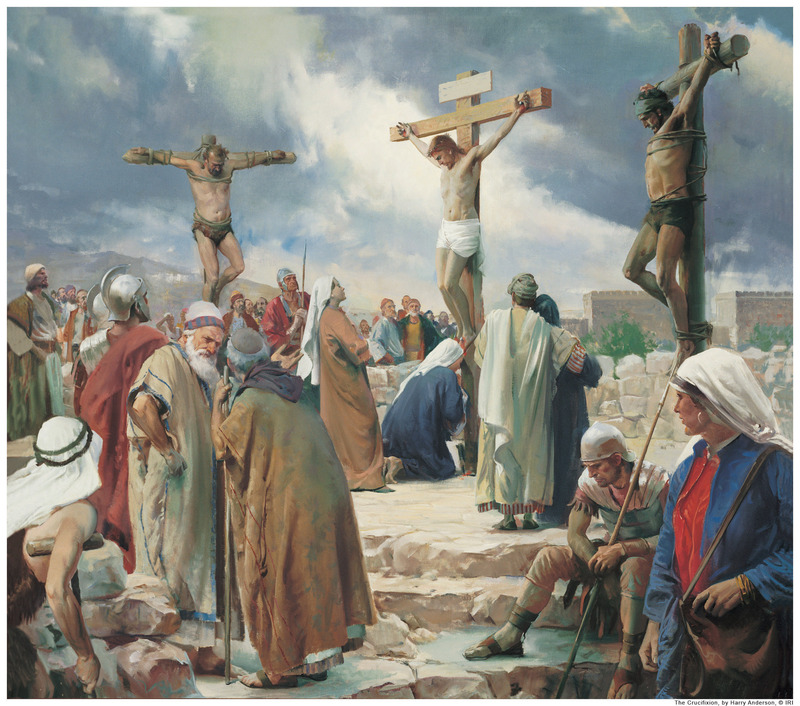 If I were innocent and subjected to crucifixion, my hands fastened to a wooden beam by nails, there would not be much significance tied to the event. The most that could be said is that, being innocent, I was punished wrongfully. The Savior’s hands, however, created and produced “worlds without number.” Those very hands were pierced, having been subjected to the most heinous crime ever inflicted. Their crime: killing God. After reading through these verses, I can’t help but think that of all the ways that the murder of the Creator could have occurred, the method of execution was slow and excruciatingly painful, accomplished by spreading out the arms and piercing the hands with nails. In the case of Jesus Christ, the hands pierced were the very hands that created all things and upon which all things created are dependent. Truly, the Lord descended below all things.